I predict that Barada, Bib, and Han Carb will be pegwarmers, Boba will be a so-so, and Chewie and Boussh will be the big sellers. Oh these are thrilling! I really like the design and the figs are top notch. Yeah, I have to say from the pics the packaging looks fantastic! The figures look pretty nice as well. I will get Han Carobinte, Leia Boushh, and probably Bib Fortuna. The others I have already but do look nice on those cards. At this point I could care less about the hologram figs. I just hope the price does not go up because of those. I just hope the price does not go up because of those. If It does go up to say, $6.99, Then I'll probably get less figures. But I think the Mini Holos are worth it. 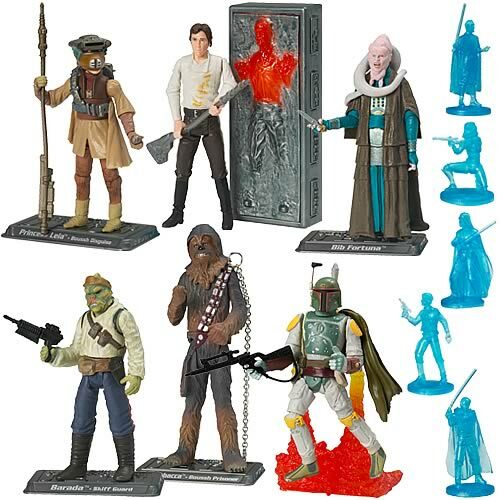 Count me in for Boussh, Han x4, Bib Fortuna, Chewie (just for the chain)....I'll pass on Action Feature Fett and might get a Barada, if he comes with the good ROTJ blaster or has a different enough paint deco from the Screen Scene. Well, if they don't go up because of the mini-holograms, I'm sure that they'll go up for some other reason. I held out hope Chewie would be some form of the VOTC/Eb figure, but alas... I'll probably just get Leia and Bib for sure. I'll wait and see on Han. Ha-ha! Yeah, that is probably correct. Barada's disappointing I think as a repack but what do I know... Fett, eh... I agree with Spuffy that I'm disappointed that they didn't try re-packing at least ONE VOTC figure. You have the mold, the main cost is done, repack VOTC Fett... Take the slight bitching from the people who paid $10 for it and just put the best Fett out you can... Hell if you're nice you'd tweak the jetpack so it could accomodate the Saga Fett's flame base. On the new figures, I have to say it's tough to say anything definitive because the pictures are really not very high quality at all so any detail's pretty much lost. I am with Darth Anton about fearing a lack in quality here though as far as articulation goes. I thought Boussh had ball/socket knees from the SDCC photos, and Han seems to have angle-cut elbows... Ok, that's cool. Bib I can't make neither heads nor tails of on any detail. I'm hoping they aren't going to start cutting articulation back in a freakin' non-movie year when that kind of quality for collectors should be their focus. ROTS did so well, their formula was 100% improved with that film line... If they start reverting back to statues they are just going to prove how out-of-touch they are with this line, this hobby, and collectors. I'm praying these are great figures because that's 3 new sculpts we really need, but I'm also reserving judgment till i see some clearer pictures... I know I saw angle-cuts on Han and ball/socket knees on Boussh so that's some hope for these. I still think re-using VOTC figures would be more appealing to people and it would help improve the margin on the cost of those sculpts... They're repacks though so whatever. Boussh is certainly the winner of the bunch for me. I don't know what to make of that Han. It really does nothing for me. I like how the Boba pic hides the missle pack. Bah. EDIT: And Jesse, I'm wondering about the articulation as well. Aside from Boussh, the other new figures look suspiciously like something we would have gotten at the tail end of Saga. Lots of cut elbow joints and awkward facial expressions. Hmmm. Han looks good, but looks to sport about the basic POTF2 articulation points from the waist down and that blows on any new figure, especially one focused around action like Han was at the Carkoon battle. Give him some knee articulation and at least make a mediocre effort. It could still be there, but I'm less hopeful right now. Yikes... hmm. Boussh looks like the only one I'll be getting. Oh, I'll get Bib, what the hell, but man. That Han isn't justifiable after the figures we've gotten the last two years. I don't know what I was expecting, but he looks a lot like the one that came with that cardboard diorama thing. Maybe they are holdovers. It would explain them being first, which never made sense to me. Kids/casual collectors have been clamoring in the aisles all year for Luke, Leia, Han, etc. and if I were Hasbro, just from a market standpoint, I'd put out something along the lines of the EB set (individual of course) that met that demand. And yeah, if they're not reusing the VOTC sculpts just because, then why bother? This entire set looks ca. 1997 (and it literally is for the most part in character selection). enhancing the EE photo I see NO joints on Han's legs. He's basically Captain Antilles if you're wanting an articulation breakdown. Ball/socket neck, angle-cut elbows, wrists, basic hips, shoulders and waist. Nothing flashy and CorranHorn makes a pretty good point that this could be a "leftover" kind of wave. One can hope right? Bib I'm ok with... The face (open mouth) is meh, but the arms I see angle-cut joints at and I'm guessing wrist joints... The robes are prohibitive to leg movement anyway so whatever, but on Han it is a bit of BS since Han was pretty active blindly killing bounty hunters and saving scoundrels during the Carkoon battle. Some simple ball/socket knee joints would've made him as big a hit to me as the Cantina Wave of figures was. All winners in my book. On Boussh I'm seeing the knee joints, perhaps even ankles, but the arms look like they may be somewhat limited in poseability. Cool nonetheless and she looks to have the most gear for sure. BTW I for one am big into these holo figures. This could be a cool way to get lots of little neat pieces to make things feel "worth" their price (if there's no hike). There's also some neat potential that maybe Hasbro would do goofy stuff like Dejarrik pieces. Could you imagine if we got those? I'd dig that (A mail-away gameboard and some little half-assed rules would be an ultimate giveaway, but whatever). I'm huge into mini-holos though... I loved the little Sidious and I have extras sitting with other figures as an Emperor holo or in dioramas acting as an Imperial communication. They work great as EU Imperial Inner-Circle Member mini-holographs too.